Two Canadians singing songs about the radio on a cold winter's night in Fredericton sounds like the setup to a joke your Grandpa once told, but it sure felt right to have Andy Shauf and Amelia Curran leading the charge. Both artists have great new works: Regina, SK-based Shauf's debut album, The Bearer of Bad News, is poised for a February release; Curran dropped her latest, They Promised You Mercy, last November. Shauf took the stage of the Wilmot United Church following a brief calm and confident introduction from the Olympic Symphonium's Kyle Cunjak and Nick Cobham (with young son Jasper in tow). It's easy to see why this is Jasper's favourite recent record, with its dreamy lullaby-like guitar work and vocal stylings. Shauf lulled the crowd into a bit of a daze with a few short, understated songs before opening up considerably, cracking jokes and initiating impromptu questions from the audience. At a festival where you often hear people talking about catching up with old friends and favourites as well as making new, Shauf definitely found some of the latter. 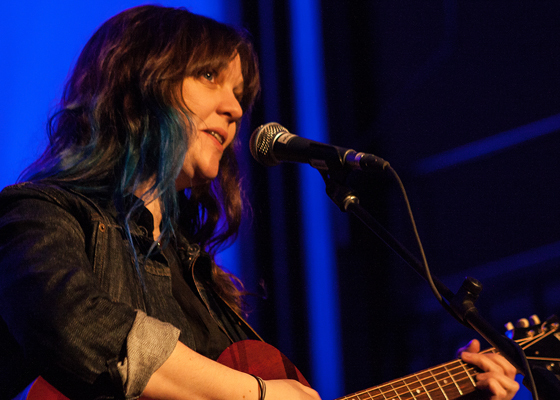 The Wilmot was well and truly warmed up by the time St. John's-based singer-songwriter Amelia Curran hit the stage with blue highlights matching the soft blue lighting on the silent organ and empty choir loft behind her. She cracked jokes from the outset to test the crowd before launching into her deep and beloved catalogue as well as more recent fare. Singing about "coming for you like a gospel choir," those were some of the only empty seats in the church, but the smiles and laughter from Curran and the crowd filled every other space. She punched up the sound a couple notches on her seventh album, Mercy, accompanying her familiar gut-wrenching and sometimes tough-to-swallow lyrical style with noisier rock flare. Of course, it should come as no surprise to fans familiar with her work and live shows that these songs, and her stage show, still work just as well with one person on stage. It wasn't that Curran's albums weren't full previously; the most recent just happened to match the size of her affable Newfoundland personality.